The information presented on this page was originally released on May 14, 2009. It may not be outdated, but please search our site for more current information. If you plan to quote or reference this information in a publication, please check with the Extension specialist or author before proceeding. The clematis looks like it was created for royalty, but in my area it’s the preferred mailbox bloomer. We have plenty of mandevillas and confederate jasmine, but in the end, the real winner in the popularity game is the clematis. 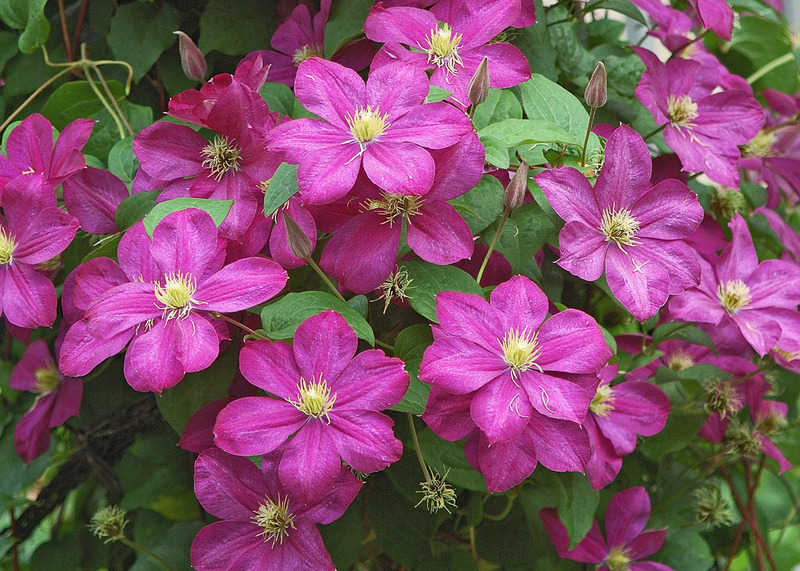 Clematis has been called “The Queen of the Vine,” and it would be hard to argue against that. You have to wonder why everyone doesn’t grow the clematis. Some species have small flowers, but most are the largest, most colorful flowers you can find on any vine. They are cold hardy from zones 4 to 9, which means just about everyone can grow them. They are tough, too. We grow them covering a mailbox beside the street where the reflective heat is intense and the water faucet is probably just about out of reach. Yet there they bloom, welcoming visitors to your home as if you have the greenest thumb around. I wonder if worries about pruning the clematis keep some people from growing them. Pruning clematis is not hard, but look it up on the Internet and you’ll find pages of articles on the subject. We’re told to prune group 1 one way, group 2a a different way from group 2b, and a certain way for group 3. 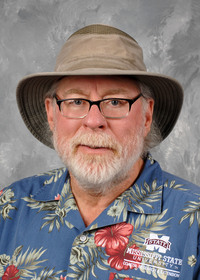 It would take four weeks if I were to include all that information in my columns. I am certain that the owners of these terrific-blooming mailboxes never read all of that. All you really need to know is if your clematis blooms in April or May on old wood, prune it after flowering, as needed to control size or to thin it out a little. Try to do this before the end of July. If your clematis blooms in June on old wood and later in the summer on new wood, prune in late winter to remove weak, twiggy growth and reveal the vigorous buds. If it blooms in the summer on new growth, prune in late winter, cutting it back hard to 2 or 3 feet. I’ve only mentioned mailboxes, but it should stand to reason that clematis would be the quintessential cottage garden vine to drape on a picket fence, let climb on a Victorian tower or wind its way up a trellis or arbor. I’ve seen them in partnership with climbing roses and in tropical settings with mandevillas. To grow yours, prepare the planting area by making the soil fertile, organically rich and well drained. Tight, heavy clay will not give the look you want, so amend with compost, humus or peat. Incorporate a little slow-release fertilizer while you prepare the soil. Plant the clematis at the same depth it is growing in the container. Don’t forget your support structure. Feed established clematis in late winter and again in midsummer. There are hundreds of varieties of clematis. I saw one nursery in England touting more than 400 selections. The gigantic, white-flowered Henryi is one of the most popular. Other white selections are Candida and Gillian Blades, which has light lavender, ruffled edges. Choice pink selections are Comtesse de Blouchard and Lincoln Star. For red to burgundy, look for Red Kardinal, Niobi and Mme. Edouard Andre. Lady Betty Balfour, Prince Philip and Star of India are choice selections in the blue-violet-purple range. Nelly Moser has light lavender and pink with dark pink stripes and is one of the most loved selections. Don’t fret if you don’t find these particular varieties at your garden center because they will have other wonderful selections. Once you start growing one or two, you’ll probably find yourself longing for more. Then you can explore the world of named clematis selections, and suddenly the species or hybrids you choose will take on new importance.